Happy winners – but who let that White guy into the Pyle family portrait? Popenoe Mountain is a pretty relaxing place, as any BURPer who has been there is well aware. 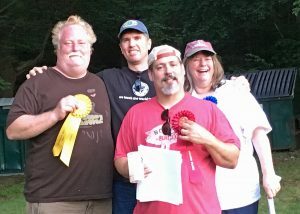 The relaxed attitude carried over to the June competition, which was judged at some point mid-afternoon Saturday after various judges and entrants had returned from some hiking adventures off mountain. It had more spectators than a typical competition, more offers of homemade jerky, and a very chill vibe. With only four entries to judge, there was no rush. Pretty much the opposite in every way imaginable from a long morning flight at SoFB! The Aaronridge crew of Bill and Wendy were joined by first-time judge Buck to evaluate what proved to be four very high quality sour beers. The “worst” beer was quite good, and the three winners all were extremely high class. The Gueuze of Dave and Becky Pyle got the judging session started, and it was remarkable given how much the judges liked it that it only got 3rd place. The mango fruit lambic from Dave White broke the 40 point barrier, and took 2nd place as an easy drinking, very pleasant sour with lots of mango character. The framboise (raspberry lambic) from Dave and Becky closed out the judging session, and literally knocked the taste buds off some of the judges, who gave it the nod as the winner.